The attachment of the top buckle is also unusual as it is attached to a small piece of webbing that has a brass chape attached, this in turn is fastened around a wider brass buckle sewn to the pouches themselves that allows a degree of articulation: This seems a very complicated method of attachment compared to later designs and reflects the time and money that can be expended in peacetime for a limited production of a design that would only see limited service. 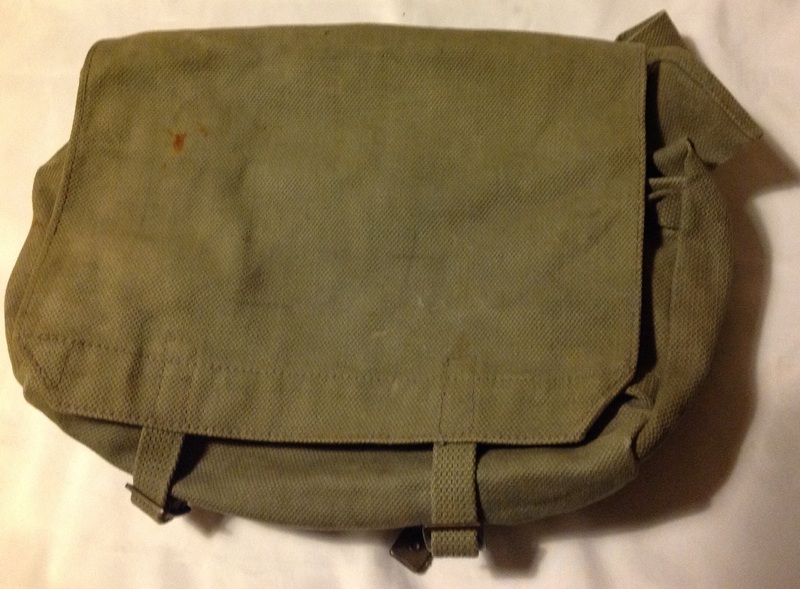 These pouches were used by airmen in the Royal Air Force armed with rifles such a sentries and those marching between establishments carrying rifles. They remained in use and production until about 1941 but as they were not compatible with 37 Pattern equipment in the way the pistol equipment was they seem to have been disposed of very quickly and don’t survive in any great numbers. 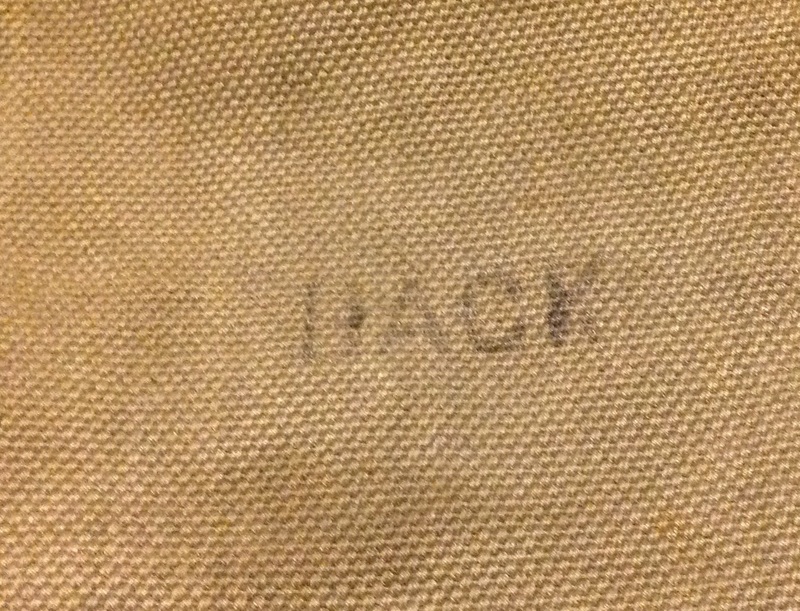 These pouches are not a matched pair and are dated 1935 and 1941- sadly it proved too difficult to get a photo of the markings. 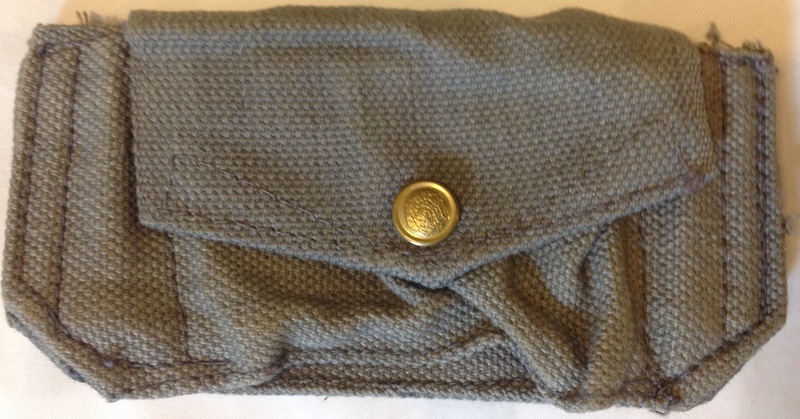 My thanks go to Andy for letting us look at this rare piece of interwar webbing and I look forward to finding my own set of these pouches in the not too distant future! This entry was posted in 25-Webbing, Inter-War, Royal Air Force, Webbing on January 5, 2019 by hatchfive. Every so often I come across a piece in my collection that I feel I surely must have covered on the blog before now, but on closer inspection find out that for some reason I have overlooked it. Tonight we have one of those pieces, the 25 pattern holster. We did look at this holster back in the early days of the blog when I compared it with the 37 pattern RAF holster here, however it has never had a post of its own and I feel that as one of the few remaining pieces of 25 pattern I haven’t covered this oversight needed amending. The holster itself is the second type of 25 pattern holster and is made of the standard blue-grey webbing used by the RAF for all its 25 pattern pieces: The earlier design of holster had featured a wooden plug in the end, much like the naval 1919 pattern holsters and was cut very differently to accommodate a Colt .455 automatic. At some point the design changed to one more suitable for revolvers which were the standard sidearm of the British Empire and this is the version I have in my collection. 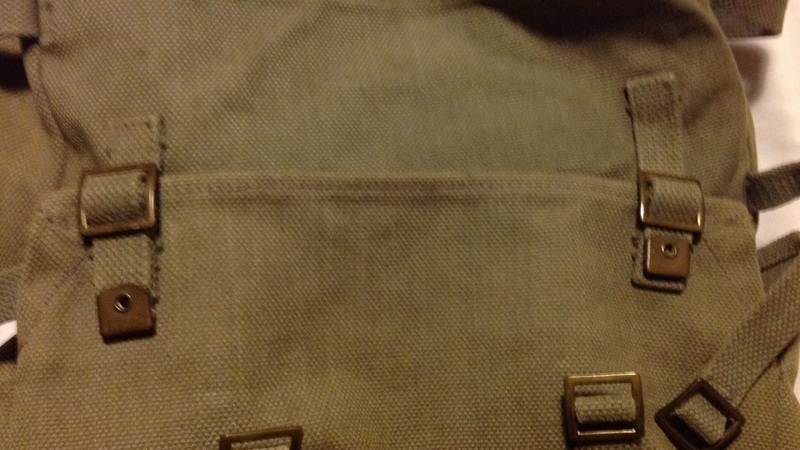 The lid of the holster is a simple flap secured with a brass press stud: A metal grommet is fitted into the base to allow any water to drain away: The rear of the holster has a pair of metal C-hooks to attach it to the belt with and a webbing channel to carry a cleaning rod: This exterior channel and the lack of a horizontal C-hook is the easiest way to identify these holsters as being 25 pattern rather than 37 pattern, the patterns being virtually identical otherwise. The inside of the holster is stamped up with an Air ministry crown, a stores code and a date of 1941: These holsters were issued as part of the 25 pattern web set to RAF personnel who needed to carry sidearms. Up until the middle of the war, any airman or officer transiting from one base to another was supposed to be issued with a revolver (I doubt this was universal practice) and the accompanying webbing set. 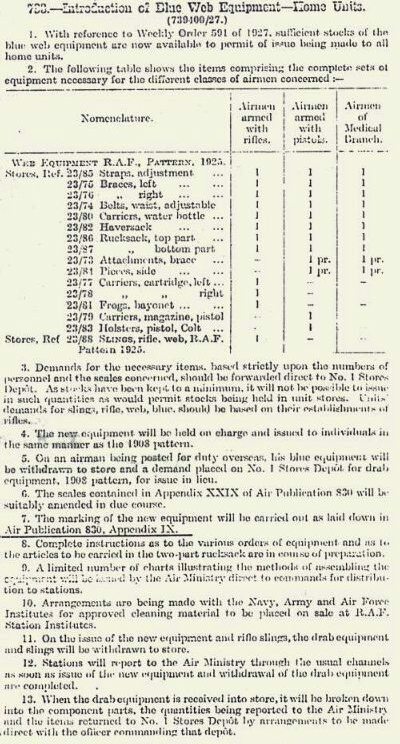 Even after this order was rescinded, webbing and sidearms were routinely carried by RAF police and men working in enemy territory such as at forward air bases. As such these 25 pattern holsters saw service right through to the 1960s when Browning Hi-Powers became the normal side arm. This entry was posted in 25-Webbing, Royal Air Force, Webbing, WW2 on July 12, 2018 by hatchfive. 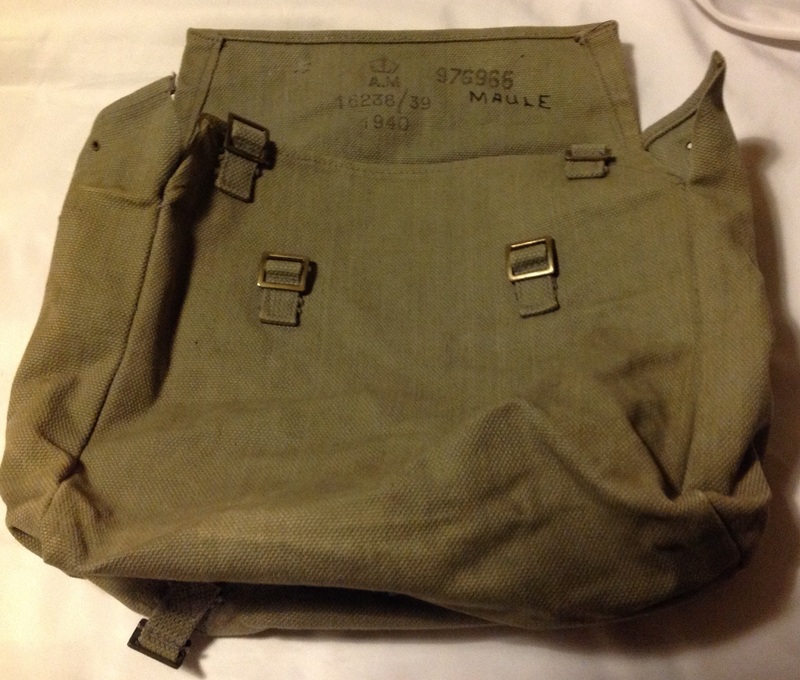 Tonight we come to what will probably be the final piece of 1925 pattern webbing we look at for some time (unless someone has a pair of 1925 pattern rifle ammunition pouches they’d be happy to part with); the belt. The belt is a three part construction, very similar to the 1919 pattern belt we looked at here: As in so many of Mill’s products the belt is made of 2” wide webbing, with a pair of 1” Twigg buckles sewn to the rear with short webbing chapes to allow the webbing set to be attached to the shoulder braces: Uniquely to the 1925 pattern belt, a pair of brass male press stud fasteners are attached to the belt: These marry up with the female part on the 1925 bayonet frog (see here for more information) to keep the frog from sliding up and down the belt. The two ends of the belt containing the belt buckle are removable from the centre back piece allowing them to be replaced with the cartridge carriers or for adjustment of the belt. If we flip the belt over we can see the brass ‘C’ hooks used for size adjustment and a webbing loop to help hold everything together neatly: Note the rear of the two male press stud fasteners on the bottom edge of hte belt. 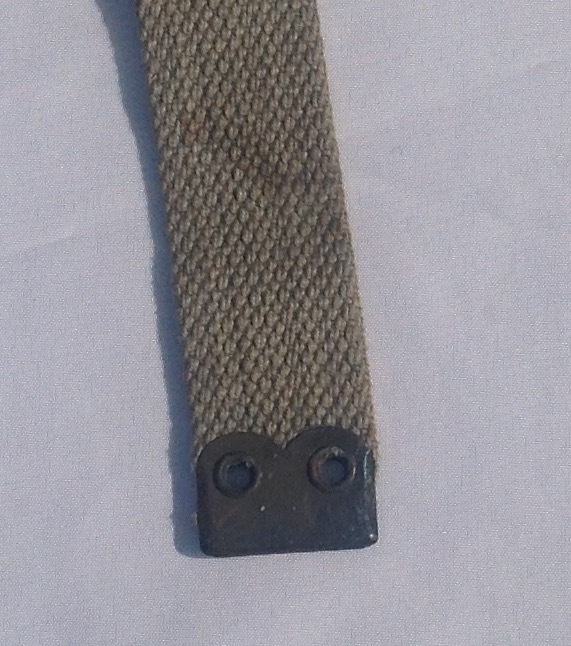 The ends of the belt are sewn onto the brass male and female parts of the buckle: These belts are seen in use alongside the later 1937 pattern belt and were worn as part of the rifle set, the pistol set, with just a bayonet and frog for parades and on their own as a replacement for the cloth waist belt of the RAF serge airman’s uniform. This entry was posted in 25-Webbing, Royal Air Force, Webbing on September 1, 2016 by hatchfive. Continuing our in depth study of the 1925 pattern RAF webbing set, tonight we come to the shoulder braces. These braces, made in blue grey webbing, are identical in design to both 1919 pattern shoulder braces and early 1937 pattern examples. 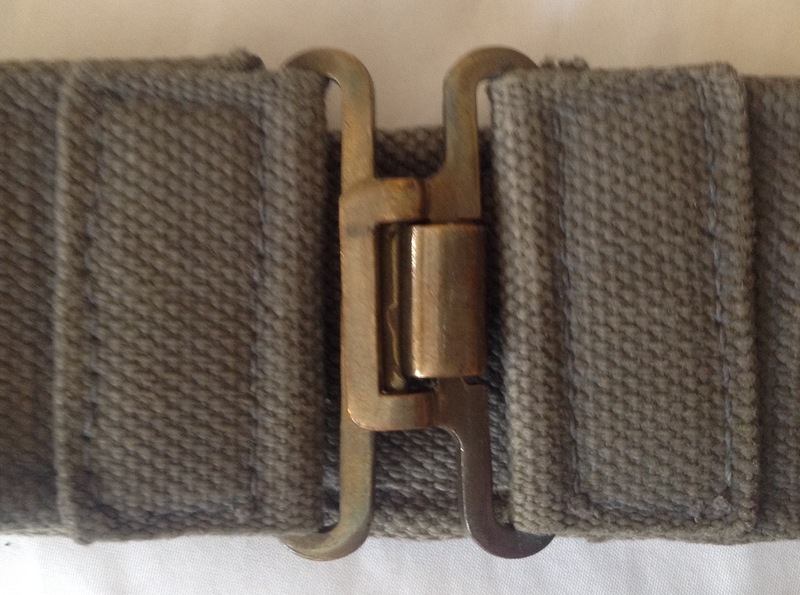 The straps are made of a single piece of reduction woven webbing, expanding from one inch wide at the ends to approximately 2” wide in the centre part where it passes over the shoulder: Each end has riveted brass tips to prevent fraying: One of the two straps has a crossover loop sewn onto it to allow the other brace to pass through to prevent them from separating and ‘riding up’ when worn: It must be explained now that the RAF adopted blue grey 37 pattern webbing and at first glance it can be hard to tell the two sets apart. The biggest indicator is the construction method of the shoulder brace- the 1925 pattern is always a single piece of reduction woven webbing rather than different widths sewn together. 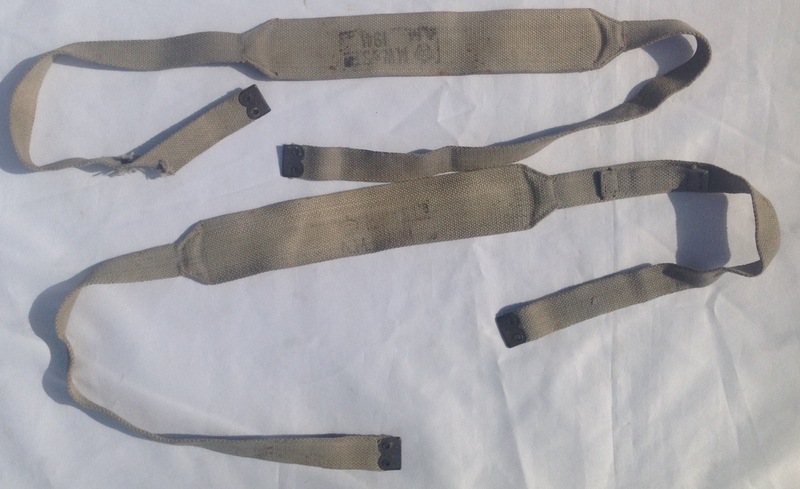 The second big clue is the date stamp on the shoulder brace itself; the RAF did not adopt blue grey 37 pattern webbing until 1943 so anything dated earlier must be 25 pattern. 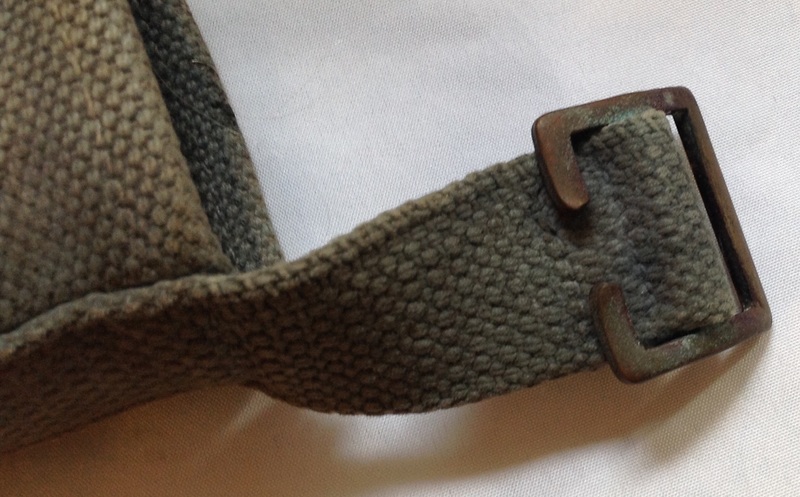 This shoulder brace has the Air Ministry Crown mark and a date of 1941 proving it must be 1925 pattern: This subtle difference then shows the value of rooting through boxes of otherwise unexceptional webbing as these rarer pieces of webbing are often misidentified and can turn up for a few pounds- a diamond in the rough to the collector. This entry was posted in 25-Webbing, Royal Air Force, Webbing, WW2 on July 20, 2016 by hatchfive. 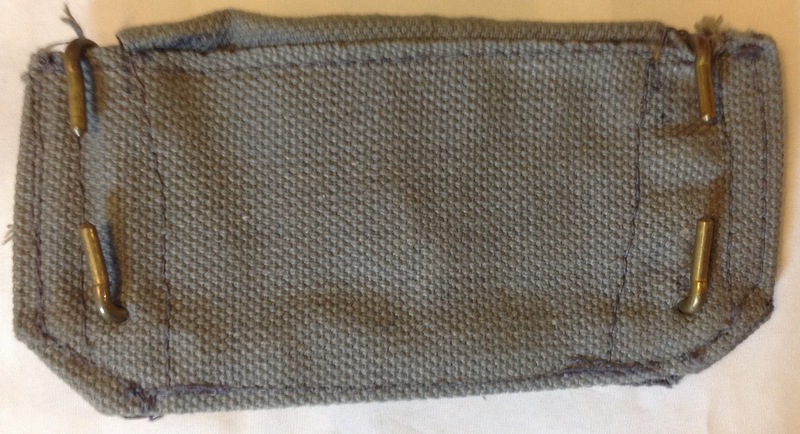 Ammunition Pouch– This is a woven box-shaped pocket of substantial weave. 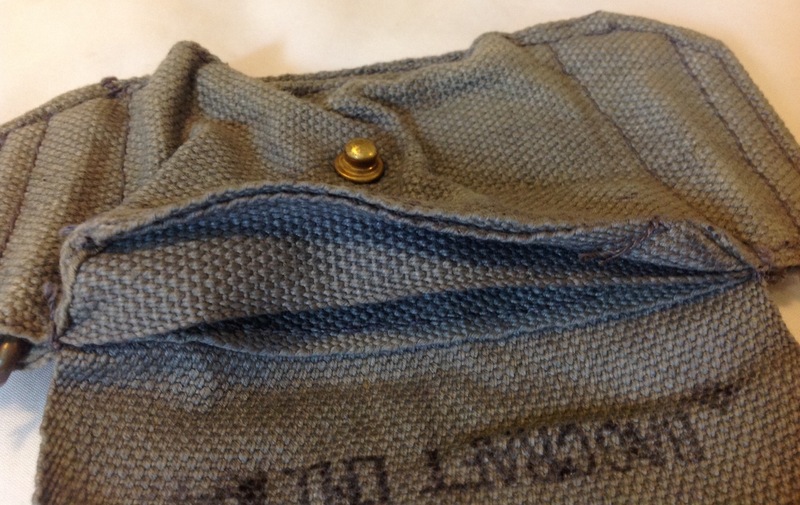 It is provided with a covering flap having a snap fastener. 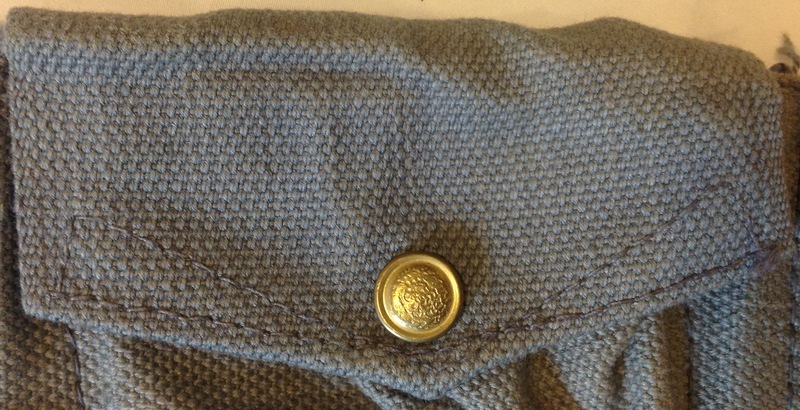 A double-hook is attached to each end of the pocket to engage the flat loops on the inside of the belt. 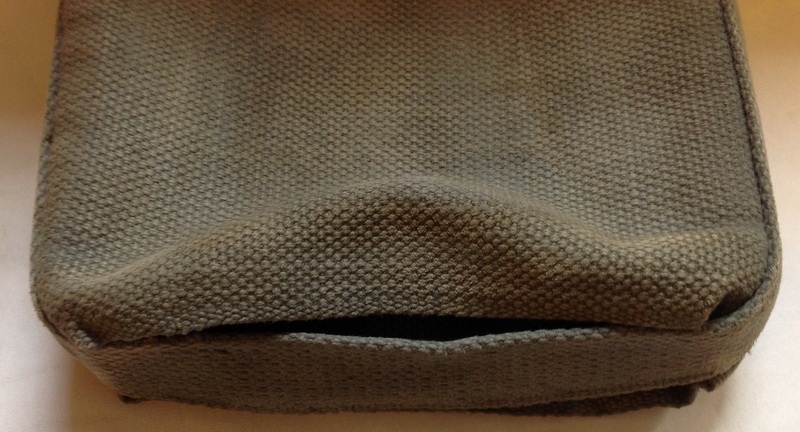 Across the top corners of the pocket, small flaps are provided to prevent ammunition working out. 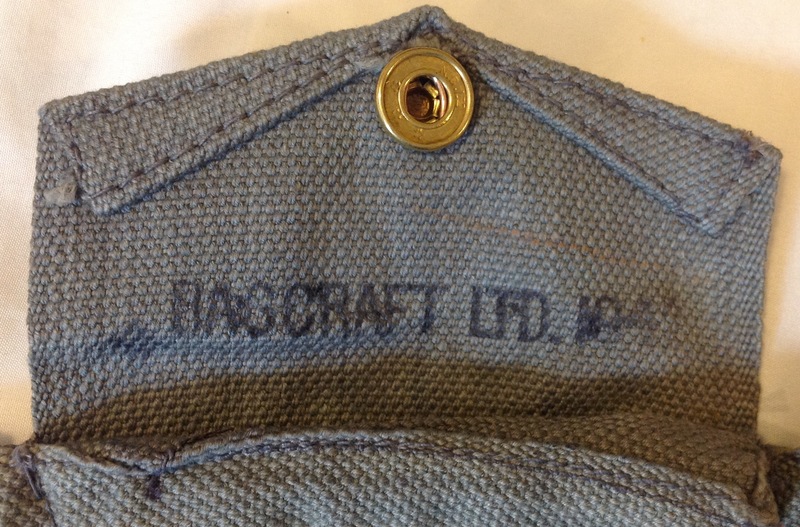 This particular pouch is dated 1941 under the top flap, along with the maker’s name ‘Bagcraft Ltd’: Bagcraft had been a London branch of a German leather goods manufacturers until the outbreak of the Second World War when it became an independent company in its own right and had substantial factories in Airedale Mill in Keighley. The company reverted to making handbags after the war and survived until 1968 when it went into voluntary liquidation. 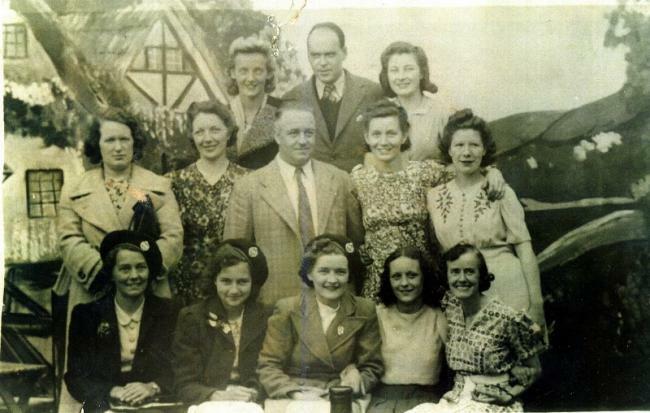 Throughout the war the firm seems to have looked after its staff well, with Agnes Taylor, a machinist, saying she ‘spent a very happy time at Bagcraft as a machinist’. There were a number of trips arranged for staff, including this staff outing to Blackpool in 1940 or 1941: The pistol ammunition pouch was adopted into the RAF with a stores code of 23/101 under Air Ministry Order No523/1938. Examples can be found both integrally woven and of folded construction. 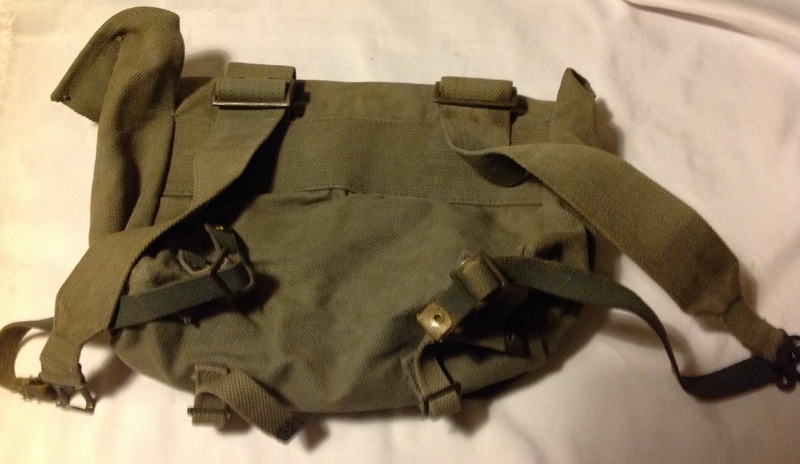 As well as being used for pistol ammunition, the pouch was also adopted to carry a Sten loader with the 37 pattern blue grey webbing as there was not provision for these on the basic pouches of this set. This entry was posted in 25-Webbing, Royal Air Force, Webbing, WW2 on July 2, 2016 by hatchfive. This entry was posted in 25-Webbing, Royal Air Force, Webbing, WW2 on December 27, 2015 by hatchfive. 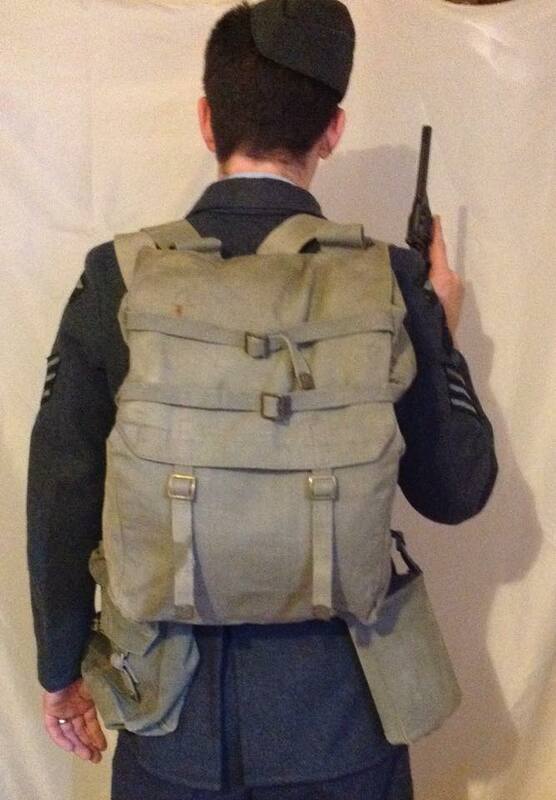 Many items of RAF 1925 pattern webbing are identical to their later RAF 1937 pattern equivalents- cross straps, brace attachments and tonight’s object, water bottle carrier, were identical. This then presents problems and opportunities for the collector; these items can be found for very low prices misidentified as 37 pattern items, but the collector needs to know what he is looking at, and how to identify the earlier pattern items. 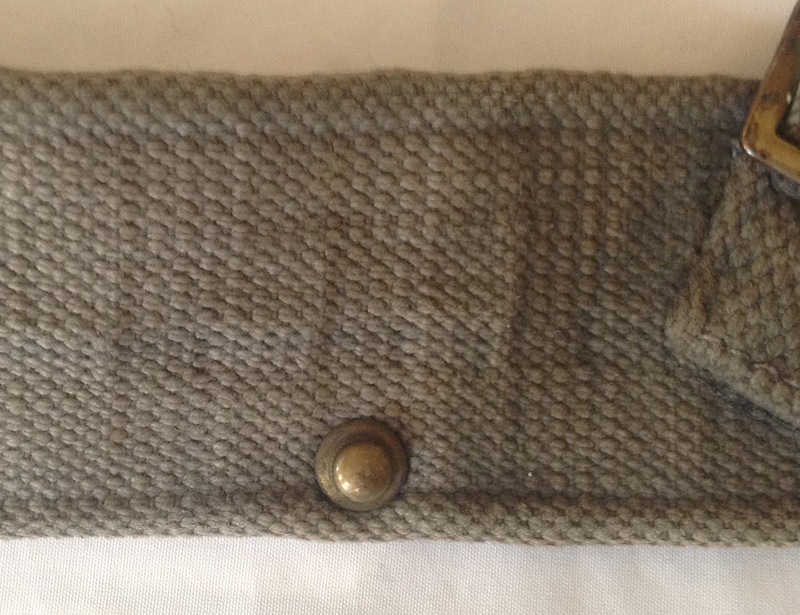 This water bottle carrier is of the sleeve type: This design had been used on a number of cavalry webbing sets by Mills before it was adopted for the 1925 pattern set, however it was the lack of any water bottle covers but drab that led to the design being used by the RAF, allowing them to hide the water bottle and present a wholly blue grey finish. The sleeve design was ironically then adopted by the army in WW2 as it was cheaper and easier to manufacture. Basically the design has a single piece of webbing that wraps around the bottle, with a strap that passes across the base: Which ends in two buckles at the top to allow it to be fastened to the rest of the webbing set: To positively identify the carrier as 25 pattern though, it needs to be turned inside out to view the markings: These have the ‘Air Ministry’ crown and markings and a date of 1939 (it is slightly clearer in real life). 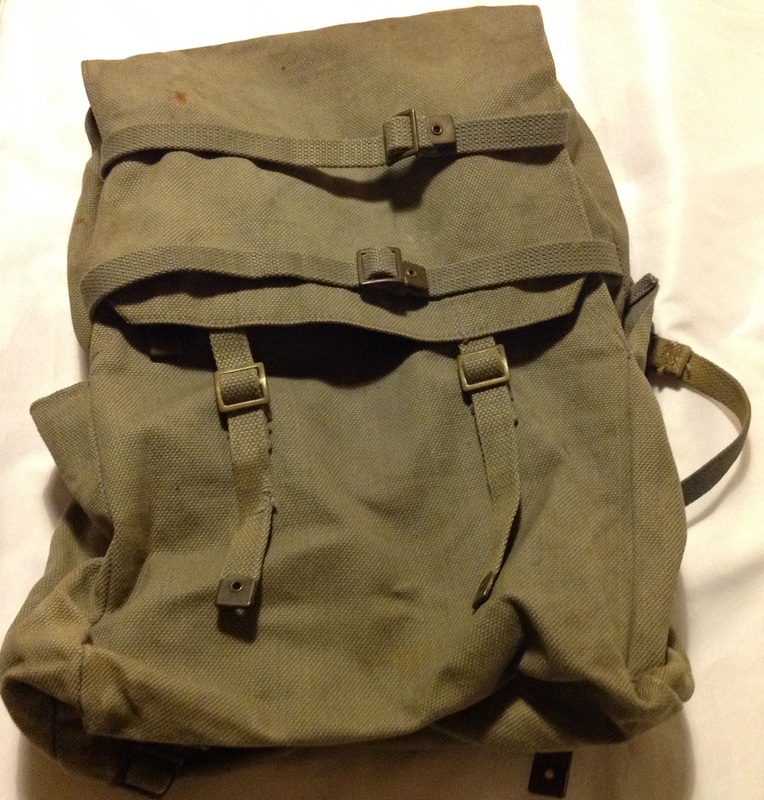 As the RAF didn’t start using 37 pattern webbing until 1941 at the earliest, this carrier can be positively identified as 25 pattern webbing. 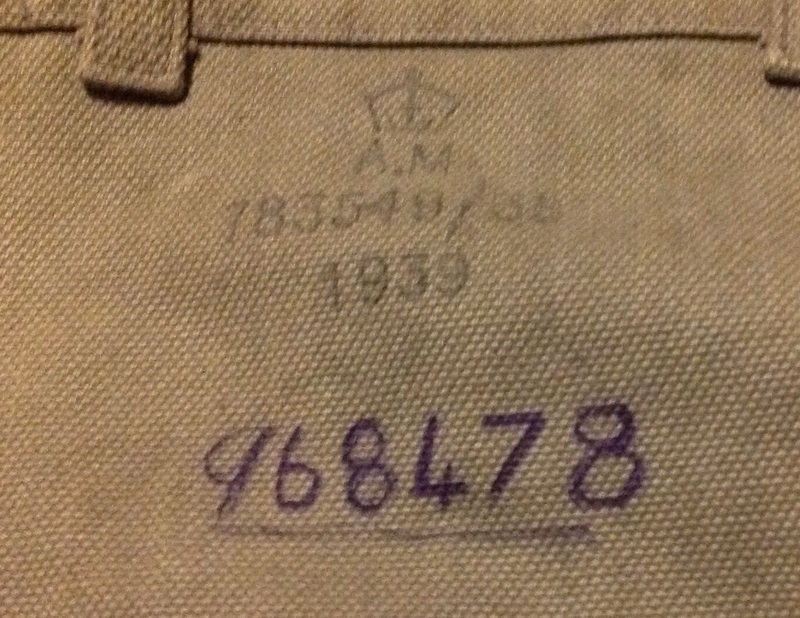 The inside of the carrier also has the original airman’s number: The number appears to be 2353415 which was a number from a batch of National Service Airmen taken on at Padgate in 1947, suggesting that either the cover had been languishing in a store for eight years or had been reissued. 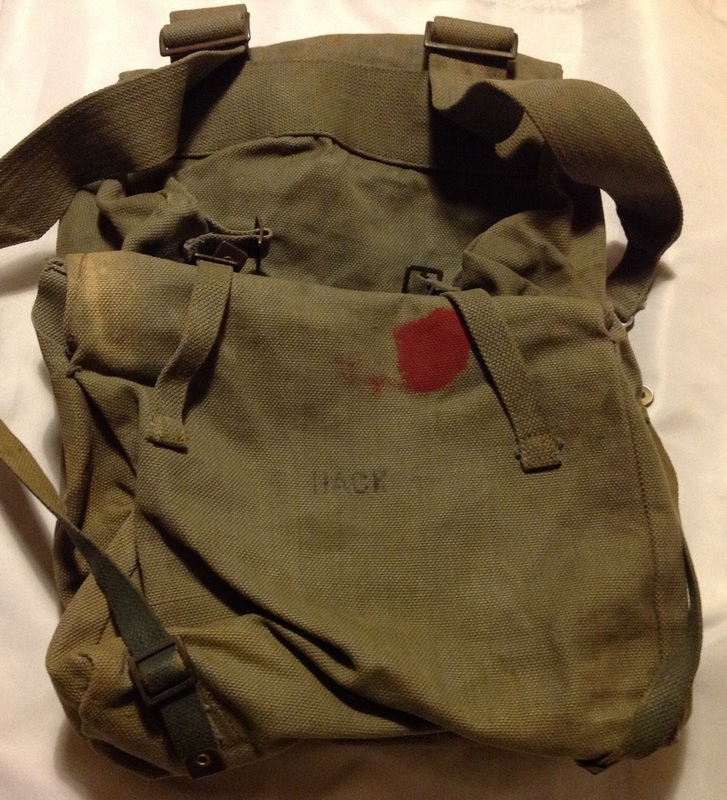 Indeed due to the similarity in appearance between 1925 and 1937 pattern webbing, they were mixed and matched for years, with no one seeming to care what an airman was issued as long as it was functional. 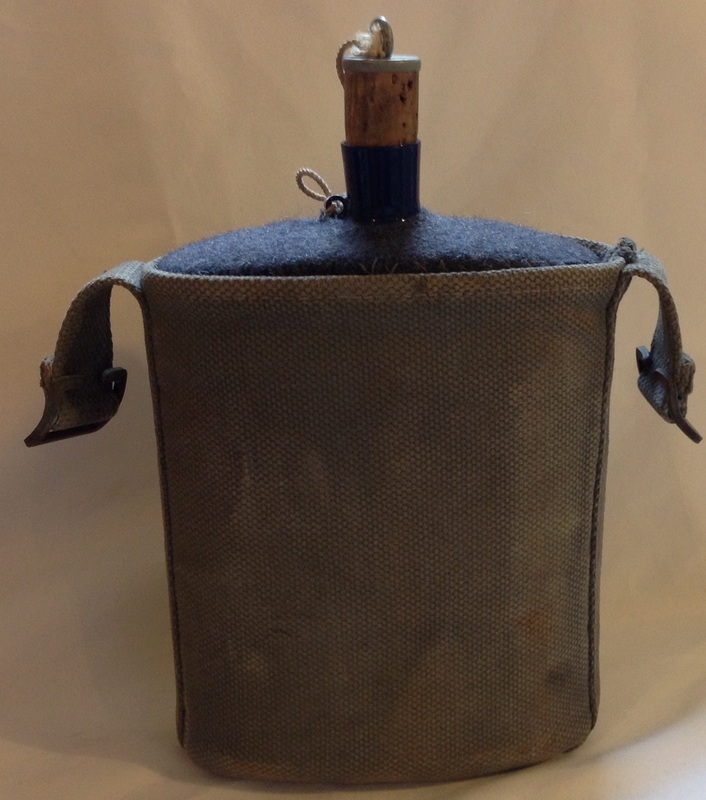 This entry was posted in 25-Webbing, Royal Air Force, waterbottle, WW2 on October 21, 2015 by hatchfive.